A friend had a Bushmaster rifle that they wanted to add a bipod to – unfortunately, the freefloating handguard has no provisions for mounting a bipod and even more, the handguard is integral to the barrel nut itself. Still, I’m always up for a challenge. To make things easier, I decided to leave the handguard/barrel nut in place and put the entire upper on the mill. This way I could use the upper receiver as my horizontal plane reference. I stuffed toilet paper down between the barrel and handguard to catch any chips, and used a strip of electrical tape on either side of the handguard to keep it from getting dinged by the vise jaws. My first thought was to use a test indicator in the spindle against the two flats on either side of the upper receiver’s bottom to get it aligned vertically, then I realized that a much simpler method would be to chuck a large diameter multi-flute endmill and bring it down against a parallel while loosely clamped in the vise. Then tighten up the vise while keeping a little pressure on the quill to keep things aligned. Viola, perfect alignment without a test indicator. Next step was to find the centerline of the handguard. There wasn’t enough clearance to use a cylindrical edge finder on the jaw faces, so I flipped the edge finder over to use the conical tip. I just had to make sure to set the stop on the spindle so that I used the same Z height on each side. Also, this wouldn’t have worked if the top inside edge of the jaw faces was dinged up, since using the conical end of the edge finder in this way gives only point contact rather than the edge contact that the cylindrical end would have provided. With the Y axis centered, I set my X axis zero as the end of the handguard and used a spotting drill to make a divot for the first hole 1.000″ in. One of the ball end milled grooves on the handguard would be sitting right under the rail, but the groove is off-center by a little bit, so the spotting drill would be hitting the edge of the groove and not able to make a proper divot. So for the two center holes, I used a 5/32″ endmill to punch holes all the way through (5/32″ is just a few thou smaller than the #21 drill used for the needed 10-32 threads). After drilling through all 4 holes, I put a 10-32 tap in the drill chuck and loosened the collet so I could spin the chuck by hand (but still have it perfectly positioned in the X-Y plane). After using a pick to dig out the toilet paper from inside the handguard, I attached the rail, and everything fit perfectly. Remove from the vise, blow out any straggling chips with compressed air, and the job is done! Ideally the screws should be installed with blue loctite (the metal is thin enough that you have to be careful about not torquing the screws too much and stripping the threads), but since my friend wanted to maybe start with having two stub rails installed instead of one long one, I’ll let him deal with the threadlocker. After discovering the semi-blockage in the support extruder, I carefully drilled it out with an appropriately sized drill bit and followed up with several pipe cleaners loaded with Mothers Mag & Aluminum Polish. I then carefully cleaned the extruder tube, and pressed on the last spare inlet buffer I have (made from Vespel, again by John). I carefully slid the heater coil back over the extruder (and tried to twist it as much as I could in order to keep it as tight as possible on the tube), re-attached the stud for the solenoid paddle, and re-attached the thermocouple probe. Then I wrapped the woven fiberglass insulation back around the assembly. The original foil was unusable, so I tried using plain old ‘heavy duty’ aluminum foil from the grocery store. It wasn’t as thick, so I doubled it up and did my best to wrap it as tightly as I could (using pieces of 3M high-temperature flue tape to hold it all in place). The next step was to re-insert the pins for the heater and thermocouple back into the circular connector (I had pulled the pins out in order to more easily re-attach the heater and thermocouple to the extruder tube). Note that the correct insertion/removal tool is the Amphenol M81969/14-01 – it took me several orders from Mouser to finally figure out the right size. I then used a few zip-ties to neaten up all the wires. Everything got reassembled back into the housing. Re-attach the motor drive blocks. After putting the head back in the printer, I ran a few feet of support filament though the extruder to flush it out. Things were looking good… …until I attached the nozzle and tried running more filament through it. Just as before I started the extruder teardown, it jammed, kinking the filament off to the side between the drive wheels and inlet buffer. Seeing that the buffer was also now cracked, I said a few choice words and called it quits for the day. Upon reflection, I figured that the extruder probably wasn’t the issue in the first place (assuming that I had done the rebuild correctly) and that the motor drive block or the nozzle was the culprit. I removed the motor drive blocks and set the head in the machine so that I could power it up and try feeding the filament through by hand. I was able to push the ABS filament through pretty easily, but the support filament I could barely budge. So I removed the support nozzle and put the model nozzle on the support extruder. Wonder of wonders, I was able to feed through the filament just as easily – the nozzle must be the problem! I reinstalled the motor drive blocks and sure enough, the support drive was able to feed support filament through the support extruder and model nozzle with no jamming whatsoever. I realized it has been over a year since I last wrote on the subject (though to be fair, it seems it has been about that much time since I’ve written much of anything substantial). Since I last addressed the topic in March of 2013, the apex of the “3D printed gun” story has been reached, and media interest in the concept has subsided. Just as promised, Defense Distributed successfully created an entirely 3D printed firearm (save for a roofing nail used as a firing pin), proved the functionality, and released the STL files. Naturally, I downloaded the files as soon as they were released last May. Ever since Defense Distributed had stated their goal of designing, testing, and proving the possibility of a 3D printed gun, I had pondered how to actually achieve such a goal. I had my own ideas in mind, and figured I could probably design something workable in a weekend, but testing and refining the design is something else – CAD is easy, but proving the model is hard. My own line of thinking revolved around using a .410 shotshell as the intended cartridge, due to its extremely low pressure in comparison with other rounds. This would have entailed building a fairly large gun with a rather long barrel (over 18 inches so as to not run afoul of the NFA), and would have taken quite a while to print. As it turned out, DD came up with a remarkably elegant gun, far more refined than what I myself had in mind – something that stayed true to the intent of pushing the limits of 3D printing. When I say elegant, I mean elegant in the Unix sense – not something that is beautiful to behold in an artistic manner, but something that has raw simplicity and efficiency in design and operation. DD called their creation the Liberator, an homage to the FP-45 Liberator of WWII, an equally simple, straightforward pistol that was intended to be airdropped into occupied Europe for partisans to use in resistance of German forces. The DD version is much chunkier in construction, but shares many of the same design intents – a gun that is able to fire a single shot with a centerfire metallic cartridge with as little mechanical complexity possible. Plus a few pins that hold everything together. Of these, only the firing pin itself is metal and is actually a roofing nail – since the firing pin needs to impact the cartridge primer and deform it enough to crush the compound between the primer’s cup and anvil, material hardness is a key consideration for the firing pin (and is a material property that escapes the current capabilities of FDM printing technology). Since I had a number of journalists ask me for my take on the Liberator, I decided to print one for myself in order to give an accurate appraisal of the design. My friend Joe (not his real name) was also interested in building and testing one to make a proper evaluation, so we collaborated on doing a proper test shortly after the design was released. Rather than re-print the entire thing (which was over 30 hours), I decided to place the part in the mill vise and plane off the top, then glue on a replacement top half. I took the opportunity to also glue in a metal block for compliance with the Undetectable Firearms Act. I bought some 1″ square steel bar and sawed a piece off the end, then found a little bit of scrap to fill in the sides. All told, I had 147 grams of steel, which should be more than sufficient to satisfy 922(p) (the specific section of US law codifying the UFA). Insight is a powerful piece of 3D printing software, and I was able to go back to my sliced version of the receiver and delete all the layers from the file that I had already successfully printed. This allowed me to print just the upper half of the receiver, and I printed a barrel at the same time for good measure. Note that the .STL file for the Liberator barrel that was originally released is a smoothbore with no rifling (just like the original WWII FP-45 Liberator). This theoretically makes it an AOW (Any Other Weapon) under the 1934 National Firearms Act (NFA). The definition of an AOW is rather convoluted (and somewhat contested, given U.S. v. Davis), but it is intended as a catch-all category for firearms not otherwise defined by other categories (hence, ‘Any Other’). A pistol or revolver with a smooth bore is generally considered an AOW, and for an unlicensed individual to make one, they need to submit a Form 1 to the ATF along with fingerprint cards, a passport photo, $200, and a sign-off from their chief law enforcement officer. In other words, if you want to try printing a Liberator and don’t want a lot of hassle, make sure the barrel has rifling in it to avoid trouble. Even modern reproductions of the FP-45 Liberator have tiny (and ineffective) rifling grooves in order to remain compliant. I made sure to add rifling to the print itself, as rifling it afterwards would necessitate equipment that I simply don’t have (but would love to build someday). Although the top half of the receiver printed without loss of extrusion, there was still a significant amount of warp on the bottom. I opted to mix up a batch of epoxy with microballoons and colloidal silica (a thickener) to glue the two halves together. I didn’t actually print the needed pins and just used some spare sections of metal tubing instead. Meanwhile, Joe used his Lulzbot to create a remarkably robust receiver out of standard PA-747 filament. He had tweaked his machine to provide extraordinarily dense prints with virtually no porosity. We decided to test out his version to determine just how well the design works, its durability, and to get some velocity data to determine actual muzzle velocity. Additionally, news stories on the Liberator seemed to generally claim that a $10,000 (or more) 3D printer was required to print the Liberator. We wanted to dismiss this notion and show that even a $1000 printer is perfectly capable of printing high strength objects. In mid-May of last year, we met up to actually perform the testing. Our test rig consisted of an 80/20 frame to actually mount the Liberator to, which itself we clamped to a folding table. In front of the test rig, we set up the sensors for my PACT chronograph (used to measure the speed of the fired bullet). For safety, we used a 30 foot length of paracord to pull the trigger. Note also that we used machine screws to actually mount the breech block within the receiver, rather than 3D printed pins. Additionally, Joe’s barrel was slightly longer than the published Liberator barrel. We had a great deal of difficulty getting the gun to fire in the first place, making nearly ten attempts to get it to go ‘bang’. The first issue was getting the sear tail to actually release the hammer, so we replaced the trigger bar with one printed on my machine. 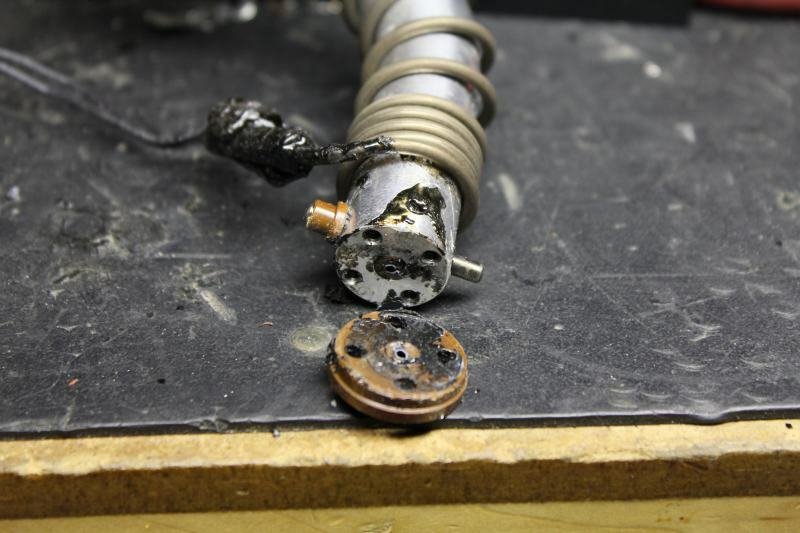 After this, the primer was indeed getting struck, but it did not seem to be igniting – we replaced the springs with ones from my machine as well. We would wait 30 seconds after each attempt in case there was a hangfire (thankfully we never had one during the testing). We wondered if headspacing could be an issue, so we pulled Joe’s barrel and put in one that I had printed on my machine. We also replaced the .380 cartridge we had been using with a fresh one in case it was a dud. Our next attempt did indeed go ‘bang’, and there was very little of the barrel left in the receiver. My Stratasys FDM 1600 still has a bit of porosity in its output, and I hadn’t done a solvent vapor treatment on the barrel as was recommended by Defense Distributed. Also, the round was a very tight fit and had to be pressed into the barrel – it’s possible that the bullet became dislodged, seating further down within the case and causing higher pressures when fired. While the barrel was destroyed, we finally achieved primer ignition, so we put Joe’s barrel back in and continued testing. The video hints at some of the issues we ran into during testing. We didn’t have the retainer for the firing pin installed, so the firing pin would rocket out the back during every shot. We used a piece of masking tape on one attempt (you can see it fly up after the shot) to try and keep the firing pin in place, but the hole punched through the tape shows that this did not work at all. We only had one roofing nail, but fortunately Joe happened to have along extra machine screws that he used for assembly and was able to fashion a replacement firing pin each time by cutting and filing it with a pocket multitool. We had to make the firing pin longer each time as well, since each subsequent shot increased the headspace, with the cartridge becoming seated further and further down the barrel each time. The 3 screws holding the breech block in place also became noticeably bent as testing continued, so we replaced them halfway through. Here’s what the Lulzbot printed barrel looked like after its first successful firing. The cartridge has actually been pushed back a bit (hence pushing back on the breech block and bending the retaining screws as noted). You can also see white spots forming (known as crazing) as a result of the internal stress. Finally, the primer has been pierced, allowing gas to erupt out the back of the cartridge, which is an undesirable behavior. However, this is not a fault of the Liberator’s design, but a side effect of using a roofing nail or ‘field expedient’ machine screw – the sharp nose of the nail or screw actually punctures the primer cup, whereas proper firearm firing pins actually have a carefully rounded nose so that they dent but do not pierce the primer. In fairness, however, pierced primers are not a great concern on a disposable firearm such as the Liberator or its WWII ancestor. Continually piercing primers will allow the hot gases to erode the bolt face, firing pin hole, firing pin tip, etc. in a conventional firearm, but for a disposable gun designed to operate only a few times, this is admittedly a minor design quibble. One thing the photo does not really indicate is how firmly the brass case is actually stuck inside the barrel. In a conventional metal barrel, the brass does expand somewhat during firing, which is actually beneficial in sealing the case to the chamber walls in a process known as obturation. The brass relaxes slightly as the bullet exits the barrel (which allows the internal pressure to drop back down to atmospheric levels), but since ABS plastic is much lower in strength than steel, the brass case expands greatly in the Liberator making conventional extraction all but impossible. In our case, we needed to use a hex wrench and a rock to beat the expended cartridge out of the barrel. Unsurprisingly, the walls had expanded so far that the case had actually split. More surprising to us, though, was the fact that the barrel bore looked entirely unscathed (not only by the projectile, but by the hot propellant gases). The photo really doesn’t show it, but in looking down the bore, the finish appeared just the same as in the unfired state. Both Joe and I presume that there is so much bore expansion during firing that the bullet itself isn’t even touching the rifling. Granted, the rifling would have done almost nothing anyhow (a copper jacket is still much harder than ABS plastic). We only managed to record two shots with the chronograph (we weren’t using skyscreens, and they probably would have helped). The captured velocities were 498.2 and 465.1 fps, for an average of 481.7 feet per second (146.6 m/s). By comparison, the very same round fired out of a conventional .380 pistol will be well over 900 fps. Consider that kinetic energy (or ‘muzzle energy’ in firearms parlance) increases as the square of velocity, and the difference is quite dramatic – the Liberator only achieves a muzzle energy of 49 foot-pounds, or roughly a quarter that of what a standard .380 pistol provides. By way of comparison, a major league fastball delivers twice as much energy, and one person has actually died as a result of being struck with such a pitch (yet a year later, despite proclamations of mayhem and anarchy in the press, there have been zero deaths or even injuries from 3D printed guns). In the end, then, the Liberator is not at all a weapon of physicality, but a weapon of philosophy, able to challenge preconceived notions regarding governmental control over the sharing of information. Which, whether you agree or disagree with his views and actions, is precisely what Cody Wilson set out to accomplish in the first place. Somewhat unsurprisingly, only a few days after DD posted the .STL files for the Liberator on their site, the US State Department sent a letter to Cody, demanding takedown of the Liberator files and 9 other designs that had been posted on Defense Distributed. The authority for this stems from ITAR, the International Traffic in Arms Regulations, which controls import and export of defense related articles, including information related to such items. That acronym may ring familiar to old hands of the internet, as it is the very same statute under which the US government blocked export of Phil Zimmermann’s PGP encryption software in the mid-90s, which saw Phil under criminal investigation for “munitions export without a license”. While the case against Phil was eventually dropped (and Cody/DD have not been actually charged with any wrongdoing), the parallels are striking. Like Phil’s case, it will undoubtedly be many years before the issue is resolved. What struck me oddly about the State Dept. letter were the 9 other designs listed as takedown targets. In my opinion, these were picked entirely at random in a perfectly transparent attempt to hide the fact that the Liberator files were in fact the sole items of interest. Specifically, item 6, “Sound Moderator – slip on” was actually designed by noted RepRap contributor (and airgun enthusiast) Vik Olliver and is still available on Thingiverse. If this was truly an ITAR violation, then why did the State Department not do anything when Vik originally ‘exported’ the file from New Zealand to Thingiverse servers in the US, and why has Thingiverse/Makerbot/Stratasys not received their own ITAR takedown letter for continuing to host this design? I could opine a great deal more on the topic, but since I attempt to limit my blog writing to technical matters, I’ll curtail my musings. Other interested people have printed their own versions of the Liberator as well – mashable.com has a superb 8 minute documentary called “I Printed a 3D Gun“, which I highly recommend watching. Travis Lerol (who has also experimented with printing AR lowers on his 3DS Cube) attempts to give his own Liberator a try, but it fails to ignite (spoiler alert). Travis tells me that he has since managed to get a round to fire, though it took about 200 attempts. A number of design remixes of the Liberator concept have also been posted online, though very few (if any) have actually been printed and tested. I was very honored to be asked by Professor Hod Lipson to make a presentation at the Chicago Inside 3D Printing conference on the topic of 3D printed firearms on July 11. I was scared stiff to do any sort of public speaking, but thankfully there weren’t many people in the audience, and I had a few friends in attendance for moral support. I’m very glad I attended, as I was able to chat with so many notable people in the field – not only Hod Lipson, but Avi Reichental (of 3D Systems), Scott Crump (of Stratasys), Scott McGowan (of Solid Concepts) and especially Ralph Resnick (of NAMII) – thanks to you all for your time and attention. Chatting with Scott McGowan and some of the other folks from Solid Concepts was especially interesting, given that only a few months later, Solid Concepts would release their own 3D printed gun, the 1911 DMLS. As a fan of John Browning‘s entire portfolio of work (and especially the M1911 pistol), I was thrilled to see such an iconic, century-old design recreated with cutting-edge technology. Solid Concepts is now actually selling the 1911 DMLS in a limited run of 100. While I wish I could afford one as a collectible (Scott, if you have an extra, please drop me a line! ), I’m simply happy to see the whole 3D printed gun media story finally reach its logical conclusion: 3D printing is simply another manufacturing technology, and its application to firearms is no different than the development of milling machines, investment casting, CNC, polymers, and on and on. Addendum: I had initially wanted to cover much more of the work done in the past year by others exploring the intersection of gunsmithing and 3D printing, but this post took long enough to write as it was. Fortunately, Andy Greenberg (who interviewed Joe and me for several stories last year, and is a superb technology reporter) has an excellent rundown of the various designs being experimented with by FOSSCAD. Speaking of Frankie, he’s been up to some amazing work lately. In December, Pete forwarded an inquiry to the Milwaukee Makerspace from a local mother whose 8 (almost 9) year old daughter was born with only partial digits on her right hand. She had seen the Robohand video and asked Santa if she could have a new hand for Christmas. (sorry, that gets me a little teary-eyed right there.) A bunch of us immediately offered to help in any way possible (I have a small supply of medically approved, gamma-sterilizable P500 filament that would be perfect for this application), but Frankie absolutely tore into the project with unbridled enthusiasm. He’s been working with others at UWM to develop a truly custom prosthetic for Shea, and has actually introduced it into a course curriculum this semester (they’ll be creating hands for other area kids in need and developing a ‘how-to’ guide for these DIY prosthetics). Frankie is still developing the hand for Shea, but I can’t wait to assist in my own tiny way (we have some ideas in mind for customization that should go over well with the end user). If anybody out there has any surplus P500 ABSi that they would like to get rid of, please leave a comment – we can definitely put it to good use. Excuse me for just a moment, I seem to have something in my eye… *sniff* For more information, check out the E-Nable page. It’s inspiring, humbling, and just kind of amazing to see what 3D printing is making possible. A friend sent me a used filament cartridge from his 3DS Cube a while back, as I had heard that they are ‘chipped’ similarly to Stratasys cartridges. Sure enough, there’s a 1-wire chip on one corner of the cartridge. Opening the cartridge requires almost destroying it. The two halves are actually solvent welded together, and inside is a ridiculously small cardboard spool of filament. One user determined that the printer will only allow 320 grams of filament to be used before declaring the cartridge to be empty. At $50 per cartridge, this isn’t quite as bad as Stratasys pricing, but it’s still insanely expensive for what is targeted as being a hobbyist machine. With the Stratasys cartridges at least, the cartridge is sealed with a gasket all the way around the edge where the halves mate, and the interior is packed with desiccant packets. No such environmental protection exists on the Cube cartridge – there’s an open hole in one side (with a threaded brass insert whose purpose escapes me), and there’s an o-ring on the exit to keep the filament in place (if you accidentally pushed the filament back into the cartridge, you would need to break open the cartridge to fish out the end). Unlike the Stratasys cartridges, there is no PCB board at all – the tiny 2-wire EEPROM is just a tiny SFN package measuring only 6mm on a side. Unfortunately, I actually broke it in half when busting open the cartridge, so I can’t actually attempt a read on it. But at least I verified that it is in fact a Maxim DS28E01 1Kb (that’s kilobit, mind you) 1-wire EEPROM. Oh, and it’s SHA-1 protected, just as I’ve heard that the Stratasys uPrint cartridge EEPROMs are. I’ve read that the printer can be tricked into running generic filament by leaving the EEPROM in place and simply telling the machine “that’s okay, continue printing anyway” when it alerts that filament is out. Newer firmware versions are said to eliminate this workaround but it appears that somebody has managed to break the cartridge encryption. They created (or at least claim to have) a USB controlled dongle to fake full cartridges so that bulk filament can still be used no matter what the firmware version. At $167 for the very cheapest version, though, I’d be inclined to just tear out the original electronics and run everything with a RAMPS board if possible. When I last wrote, I was dealing with a Stratasys FDM 2000 head solenoid that just wasn’t working. Well, I managed to get a replacement (thanks, John!) and sent the original off to a company in the Chicago area that rebuilds old automotive starter solenoids of that same ‘crimped can’ construction. I think one of the leads simply became detached from the coil winding, which should in theory be a simple repair. But having zero experience in that realm, I’m happy to let an expert take a crack at it first. The solenoid from John works like a champ, so it was on to the next problem – a persistent clog in the support extruder. I found that I could extrude support material happily enough if I removed the support nozzle, and I did see a few specks of crud get flushed out from the support side as I ran foot after foot of filament through it. I also cleared out the nozzle itself with a 0.011″ drill bit in a pin vise, just as I’ve done on my 1600. Still, this didn’t seem to help much. I could extrude a little bit of material out of the nozzle, but after perhaps 10 seconds or so, the material would stop coming out of the nozzle and would backflow out of the inlet buffer. I figured that there must be some sort of blockage still in the extruder, so I purchased some soft brass wire and the teeniest wire brushes I’ve ever seen from McMaster-Carr. I removed the nozzle from the support extruder as well as the support motor drive block, heated the support side to the normal operating temperature in the printer, then quickly removed the head and ran about a foot of the brass wire through the extruder to drag out as much of the soft support material as possible. I also removed the inlet buffer, but forgot that they actually have a tip that presses into the metal tube that serves as the ‘hot end’, thus rediscovering the issue that Rob @ Incredilution had found when attempting repair on his head. Namely, I broke off the tip in the heater tube. Naturally, I shrugged and put the inlet buffer back in place after cleaning, figuring that the break wasn’t a big deal. I was mistaken – when I heated the head back up and tried feeding support material in once more, the material backflowed out of a heretofore undetected hairline crack on the back face of the buffer itself. I removed the inlet buffer once more and used a screw to extract the broken tip from the heater tube. Fortunately, John had machined some replacement inlet buffers some time back from some scrap Torlon that I had sent him, and I’m glad I had one on hand. Unfortunately, even after thoroughly scrubbing the support extruder, things were now worse than ever, and I now get material backflowing out of the inlet buffer without even a nozzle attached. I’m somewhat at a loss to explain why this might be, but the best I can figure is that running the brass wire and mini wire brushes through the extruder might have scratched the interior surface, causing sufficient friction to keep the soft plastic from extruding out the end. With that possibility in mind, I figured I needed to fully tear down the head for a deeper look. Here’s a look at the bottom side of the head with the bottom shroud removed showing the vanes that direct cooling air over the nozzle tips. With the exterior shell full removed, we have a good look at the internals. Here’s the bottom side of the head. The thermocouple runs right into the end of the melt chamber. Removing the aluminum foil outerwrap reveals the fiberglass insulation wrap. With the fiberglass out of the way, we can see the heater coil wound around the melt chamber. I first had to use a small punch to drive out the roll pin securing the solenoid paddle to the extruder. Then I could finally snake the extruder free of the heater coil. I had tried to slip the coil over the end, in the hopes of easily replacing it, but replacing any of this is going to be tough work. And here it is – the ‘hot end’ freed from its overwrappings. Now I just need to remove the inlet buffer and give the tube a solid cleaning to try and figure out what is causing the clog. A tale of two Stratasyses. Stratases? Stratasi?? Early this year, I managed to get a good deal on a Stratasys FDM 2000 from the guys over at the Cincinnati hackerspace, Hive13, making this the third 3D printer I’ve purchased (and the second I’ve sold to Frankie for use at the DCRL, but more on that later). What makes it particularly nifty is that it has a soluble support head, which is quite rare for an FDM series machine – most had plain old breakaway suuport heads. From the start, I had intended to loan this printer to the DCRL, since I’ve been looking for a professional grade FDM printer for Frankie for quite some time – he’s done amazing things with the RepRaps he and his students have built, but there’s nothing like having a machine that runs a separate support material (to say nothing of having a much larger 10x10x10 build envelope). Once I brought the machine home, I parked it at the Milwaukee Makerspace for a few months so I could give it a checkout and let the other members use it for the time being. Despite having a great deal of experience with the FDM 1600, the 2000 had me stymied when I tried actually printing with it. While I was able to get the head spooled up with filament, I just couldn’t get the machine to actually print anything. Thanks to John Branlund, I found that the issue was the door latch – unlike the 1600, the 2000 has a door latched sensor and will lock the door and proceed with the print cycle only if the user latches the door closed. With that figured out, I could actually try some printing. Naturally, a shot glass had to be made for the first print, though it was quite porous, and the few mL of beer I put in it quickly filtered through the bottom. RapidPrototypeTech, who had previously owned the machine at one point, told me that because this machine has a soluble head, you have to make sure to select soluble support in the software even if running breakaway support. The difference between the heads is primarily in the motor gearing – a soluble support head is geared much lower from what I’m told. However, even when trying the exact same job and specifying soluble vs. breakaway support, I still wasn’t seeing any difference in the output – the model extruder simply wasn’t putting out nearly as much material as it should. Stratasys manuals really don’t provide much help, as such adjustment would be left to a service technician. While there are some adjustment pots on the main control board (in the lower center of the above photo – the pairs of mustard and blue colored components with screwdriver slotted adjustment screws) that John suggested could be used to adjust the gain for the extruders, I was really hesitant to start messing with potentiometers. Having disassembled various electronics in my youth, I discovered long ago that messing with such components could very quickly make things stop working properly. While the years since have taught me that multimeters and oscilloscopes can be used to properly fix such exploration, I still have resistance (pun not intended) to adjusting potentiometers if I don’t know exactly what I am doing. So I looked around for an alternate method to boost the extrusion rate. While this does in fact work, the allowable range for these values is +/- 50, and bumping the ABS model value all the way to 58 results in “NV Memory Error” showing up on the LCD display during powerup. If anybody knows of a better way to adjust the flowrates (even if it is messing with the potentiometers), leave a comment. One thing I noticed with the 2000 head versus the 1600 head is that the 2000 head is slightly larger to accommodate larger gearmotors and even dual sets of drive wheels if the material warrants it. In this case, there isn’t a second set of drive wheels but rather a guide funnel. The motor for the model material side appears to have the same information, but says 09/97 instead of 37/99 – I’m guessing that may be a date code (week/year format). Note that the actual ‘heater chamber’ is the same size on each head, but the area for the motors is larger on the 2000 head to accommodate a second pair of drive rollers depending on the material the head is designed for. On powering up the machine, all seems well, except for the support nozzle – specifically, the solenoid wasn’t activating to lower the nozzle. I took the head out of the machine and found that the wires to the solenoid were pinched between the cover and front plate of the head, possibly shorting them. Even worse, a multimeter check showed no conductivity between the two leads. I checked my FDM 1600, and found that the solenoid had about 25.4 Ohms of resistance and was supplied with 24vdc (with a clamping diode to kill the spike that comes off of the coil when de-energized). While the solenoid on the FDM 2000 head has no identifying information, it appears to be identical to the one on the FDM 1600, which says ‘LISK S-2379’ (I had a bit of info on the 1600 head in on old post). Even though my previous contact with the Stratasys support department was less-than-helpful, I figured I’d give them a call and see if they might have any spare solenoids. Unsurprisingly, they don’t have any. They don’t have anything for the old FDM series machines as of the end of 2011 – FDM owners, we’re entirely on our own. Stratasys will still give you trade-in credit on your old FDM series machine if you wanted to upgrade, but I don’t think this is a great deal. These old machines are quite nice in that they’re constructed with a lot of off-the-shelf parts, and are easily modified/hacked. I think it’s rather telling that there have been a whole bunch of academic papers on 3D printing that use an FDM thousand series machine as the testbed, but precious few papers have been done with the current P-class machines – they are far more proprietary in nature and don’t lend themselves well to experimentation. At any rate, if Stratasys was a bust, at least I could contact the solenoid maker, G.W. Lisk. Lisk only makes custom solenoids and doesn’t have any stock offerings, so I gave them a call to see what they could tell me about model S-2379. Yes, it was made specifically for Stratasys. It’s a continuous duty 24vdc solenoid, with a coil resistance of 21.6-26.4 Ohms at 25°C. And that’s about all they could tell me, other than that no, they didn’t have any in stock. I didn’t ask how much it would cost to have more produced, but I got the distinct impression that it would be greater than one arm and one leg, so I did not pursue that line of inquiry. In looking around at off-the-shelf solenoid offerings, I’ve noticed that when it comes to 24vdc solenoids, they generally bottom out at around 80-90 Ohms or so, and are much larger in diameter than the S-2379. The lower resistance results in a much larger power draw and more force, but given that the solenoid operates in a 70°C oven, this derates the performance. At any rate, I seem to be out of luck in sourcing an off-the-shelf replacement and am investigating whether or not I can have the existing solenoid repaired. When machining the scope mount spacer rings in a previous post, I had been planning to finish them when Max had stopped by one evening. Simple enough – fire up the RPC and turn on the lathe. Only thing was, the red ‘start’ button on the RPC was stuck and I couldn’t press it in. What the heck? Being in an impatient, Neanderthal-esque mood (I was hoping Max could take home all the parts for the project that night), I powered down the system and removed the button so that I could hammer it into a variable on/off mechanism rather than being restricted to the single, not-terribly-useful state of ‘off’. With my ‘fix’ complete, I re-installed the switch in the semi-dangling sheet metal front panel (I plan to fully enclose the whole thing nicely one of these days, honest). After throwing the mighty disconnect to ‘on’ once more, I pressed the just-tweaked red start button again, and the system fired up. However, things were not sounding right, so I pressed the black stop button right away. I surmised that the growling must be due to loose items sitting atop the plywood sheet that adorns the RPC cart (and acts as more horizontal storage space than I care to admit). So I pressed the red start button again, and let the system growl angrily while I prepared to turn some perfectly good aluminum tubing into swarf. After perhaps 10 seconds, there were loud popping sounds coming from the RPC, followed by me hopping around trying to turn off every electron flow nearby. After I finally hit the main disconnect, I had a look at the carnage underneath the plywood sheet, where we both saw some rather impressive green flames emanating from what had been the bank of starter capacitors. “Um, what temperature do electrons burn at?” he quizzed, a highly amused grin on his face. After I had finished blowing out the flames (note to self – buy fire extinguisher for garage) and giggling over the absurdity of the situation, I determined that finishing the scope rings would simply have to wait for another night. We pulled out the smoking remains of the capacitor bank and had a look. So, that’s what’s inside an electrolytic capacitor – foil, paper, and magic smoke. As everyone knows, once you let out the magic smoke, nothing works correctly, and you can’t get the smoke back into the component it escaped from. After I checked my notes (that is, my previous blog posts on actually building the RPC), I re-familiarized myself with the circuit. I had connected the starter capacitors directly through another pushbutton module, as I didn’t have a suitable relay at the time. I recalled consulting with our EE at work about the use of just the pushbutton for the starter capacitor array, and he said that while it wasn’t ideal given the amperages in play, it would probably hold up just fine for several dozen to a hundred startups, which sounded just fine to me at the time (and then I promptly forgot about that limited lifespan). I don’t know exactly how many RPC startups I’ve had since building it, but it’s certainly within that range – he gets major bonus points for accurate estimation of the failure mode and timeframe. Really, I should have noted the signs of excessive current when I first pulled the pushbutton out of the panel. The melted plastic housing right next to the screw terminal at the very rear of the module is a dead giveaway for “something ain’t right over here”. So I replaced that module with a spare that I had, and decided to actually do things correctly this time. Well, more correct at any rate – if it blows up again, I may have to reconsider my approach. I used an Allen-Bradley contactor (the gray device on the left) with the 120v coil wired in to the start switch by way of the step-down auto-transformer (black box in the upper right). The previous bank of ten 64mfd start capacitors (bits of their innards still sprinkle various components) has been replaced with three 208mfd caps (which I would have used initially if Surplus Center had them in stock at the time). The big rectangular run capacitors remain unused, the poor things (well, it’s a better life than erupting into a cloud of electrolyte and flame). Starting the newly repaired RPC was not quite as nail-biting an experience as the very first time, but still caused me to grit my teeth when pressing the red button. Fortunately, all my work had been properly done, and the RPC started up in a flash without issue. In fact, it seems to be even more reliable at this point – I’ve started it up perhaps 5 times or so, and each time was perfect. I didn’t have to release the start button after 1.2 seconds because it didn’t sound quite right – every start has been confidently powered, with no hesitation. The scope rings were turned with ease, and the system is better than ever!